The DG is in the middle. We were the second club he had visited since taking his office. He presented the club with a banner, 'Be the Inspiration' with emphasis to inspire change from action to reaction. He talked about his five day training in Sandiago. The vision statement is: People unite to see lasting change in community and ourselves. Last year there were 58 clubs in our district. We have gained 2 since. The K&K club members joining the DG are seen in the picture below. On 29th July our president Hugo and his son Humphrey took part in the Prudential Ride London 100 mile cycling event from the Queen Elizabeth Olympic Park to the Mall via the Surrey Hills. The weather was appalling with strong winds and almost continuous rain making riding conditions hazardous in places. However it was worth it for the the sense of achievement at the finish and the satisfaction of raising over £1,000 for St. Luke’s Hospice from their generous sponsors. Hugo's tremendous energy and a resolve to raise money for the St. Luke’s Hospice charity is adorable and an iconic continued contribution is much praised by his club members. with the Rotary evolution in Uganda. However, it was sad to hear some prominent years old sites were now being redeveloped for commercial gains. Perhaps this is by no means a unique exmple as we see here sky rises springing up where least expected. 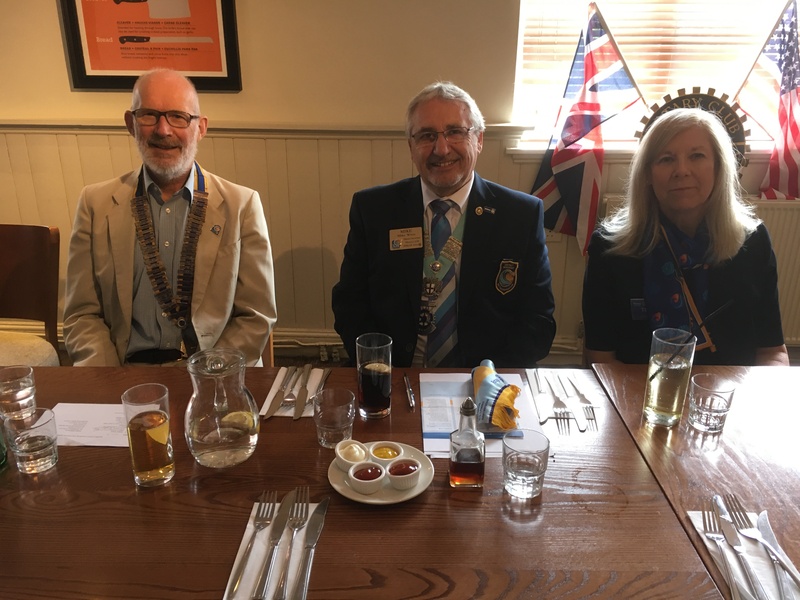 Rotarians and guests assembled at the Travellers Rest Hotel, the normal weekly meeting venue. Among the gustes were the Harrow Rotary club president, the Rotarians and some oversees visitors. Do you remember the Polio epidemic in the UK during the 1940s and 1950s? Most of us are old enough to have known people who died of, or were seriously disabled by polio. In our club we befriended a lady from Edgware Hospital who was encased in an iron lung without which she would not be able to breath. Decades later a mobile respirator was developed which enabled her escape her iron lung for brief periods. She was then able to visit our club for lunch on a couple of occasions. The epidemic ended with the development of a vaccine in the 1950s. Another vaccine had been developed in 1796 by Edward Jenner to protect people against another deadly disease - smallpox. Despite the vaccine being widely used, smallpox was not eliminated until 1980 after an intensive campaign by the World Health Organisation. I believe it was the campaign to eradicate smallpox which first interested Rotary in polio eradication. To date Rotary has spent $1.7 billion and Rotarians and other volunteers have vaccinated 2.5 billion children in 122 countries. There are now only three countries in which polio is still epidemic - Afghanistan, Pakistan and Nigeria, and this year in those three countries only 14 cases have been reported. Rotary has now pledged to raise $50 million a year for the next three years. For every dollar raised the Bill and Melinda Gates Foundation has agreed to contribute two dollars. With this level of support we may be able to celebrate the end of polio within three years. For more information go to www.endpolio.org. The following events are artanged to see the year 2018 out. 3. Donate to the Harrow Food bank.